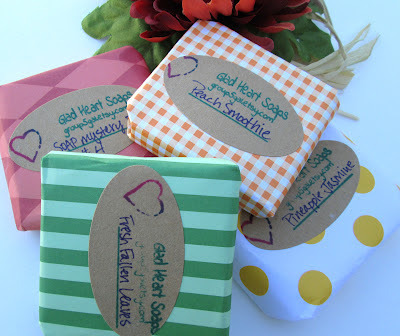 I wanted to share with you the gorgeous soaps that my soap blogging friend Laura, from Glad Heart Soaps, recently sent to me when we all took part in a forum soap swap that she so kindly organized. 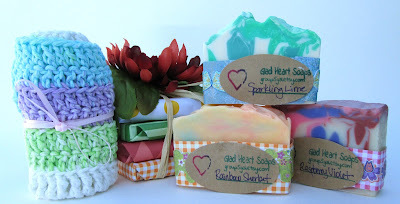 It was so much fun, and I was blown away her generosity….look at the beautiful array of soaps she sent! Her mom crocheted the wash cloth, isn’t it just adorable? I’ve tried to knit a wash cloth and ended up with big gaping holes…her mom’s is stitched so neat and tidy and I love the pastel colors! I love how colorful and bold Laura’s soaps are, they smell fantastic! I couldn’t stop sniffing the Rainbow Sherbet, it smelled sooooo good! See that cute little stack with the flower on top? I didn’t want to open it, it looked so pretty! But I did……I love the matching papers and they looked so nice all wrapped up…..I didn’t want to open them up! But I did, ha ha! I’m in love with the soap curls on top of her Fresh Fallen Leaves and Pineapple Jasmine soap, so pretty! I was especially excited to see Mystery Fragrance #4….Laura was selected to be a member of BrambleBerry's S.O.A.P. team this fall, and this was one of the fragrances they sent her to test! I can’t wait to see what this fragrance ends up being…I detected chocolate and coconut, but Laura tells me that she and Jenny from I’d Lather Be Soaping definitely picked out pear (my nose is just a little off…lol!). The first thing I noticed when I lathered up Laura’s soap was how SILKY it was! The lather literally felt silky on my skin, so I looked on her soap label and sure enough, her soaps contain tussah silk fibers. I must try some silk in soap, you can definitely feel the silk and her soaps have such a lovely, rich, creamy lather! I loved the wide variety of fragrances that she used too...from sweet to crisp to fresh. If I had to pick an absolute favorite fragrance…it would be a 3-way tie between the Rainbow Sherbet, Peach Smoothie and Fresh Fallen Leaves. Honestly though, they all smelled fantastic! I absolutely adore each and every soap you sent Laura, you completely spoiled me....thank you from the bottom of my heart! 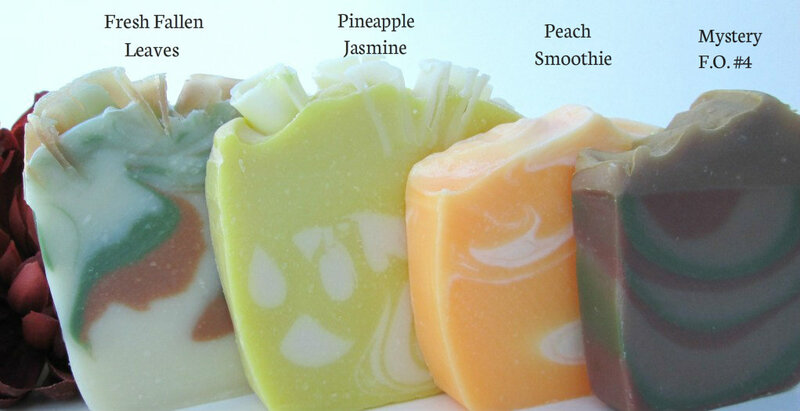 Aww, how nice that you get to try some of Laura's lovely soaps! When she and I met in August, we swapped some soaps with each other. 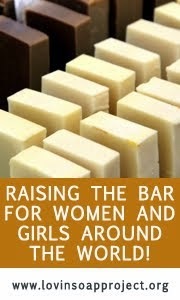 Laura was very generous with her soapy gifts, and I am still enjoying her bars. (I already used the Rainbow Sherbet, and I've got Peach Smoothie in my bathroom soap dish now.) And isn't her mom a wonderful knitter? I have one of her pretty washcloths, too. Enjoy! Oh, and thanks for the shout-out! Those are so beautiful and the packages are cute too. How nice to get these beautiful soaps! You are so lucky, Cee! Aww, thank you for all the kind words Cee! I'm glad you liked all the soaps! (I do tend to be a little over-generous with my soap gifting, because I don't really sell and have SO much soap haha!) We are using Rainbow Sherbet in the shower right now, and I really love how fresh and citrusy it is. I also really love the silk fibers in my soaps too for the feel it gives. I remember how everyone emphasized what a difference the fibers make in CP, and it really is true! I try to tell everyone the same, but I think you have to see/feel it to really know why everyone says so haha. You're most welcome Laura, you deserve the praise! The silk definitely kicks the soap up a notch, I'm going to try some for sure! I've been trying to get tussah silk muself, I;ve read about the feeling it gives, but unfortunately, still haven't. And Laura, you should start selling, I don't know what's stopping you! 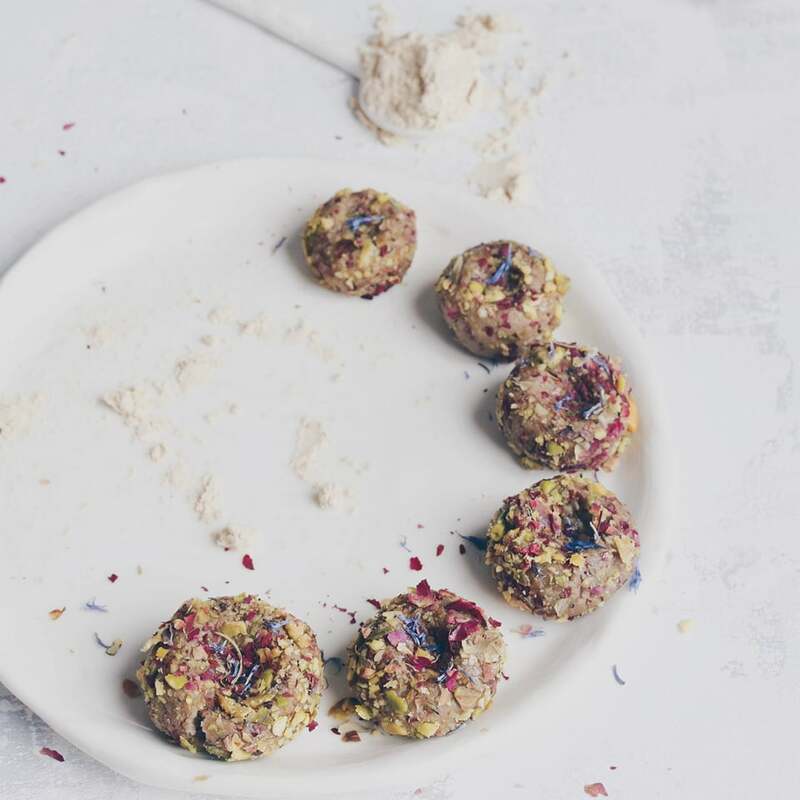 These soaps are as beutiful as skin-loving! Ha,ha, undyed silk fabric would be even more difficult to find. I've read people use it, but honestly, I was a little sceptical about that way. I might be wrong, it maybe works, but still, I would regret wasting some nice fabric. I think I will try some German online shops and use some connections there, to bring it to me. You're welcome Maja and good luck, I hope you're able to find some! 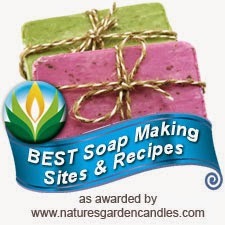 I get mine from Soap Making Resource. (They have excellent sample grab bags with every order and great customer service!) It's a tad expensive when you consider the actual weight, but at the suggested usage rate it will last a very very long time! And still much cheaper than liquid silk. Using silk in soap is on my "to do" list and I think it may need to get bumped up a few places. Laura, thank you for sharing your silk source. I'm enjoying her soaps so much, and thank you Linda...I'm glad you're enjoying the luxury soap :) If you get a chance to try the silk soap, make sure you post some pictures!